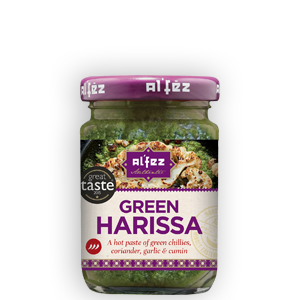 Green Harissa is an incredibly versatile hot paste of Green Chillies, Coriander, Garlic and Cumin – from an original Middle Eastern recipe. Sometimes called Schug or Zhoug, this traditional Yemenite hot sauce can be used straight from the jar as a dip or spread for sandwiches, or added to hot meals for a punch of spice. Keep a jar in your fridge to add a bit of zing to any number of recipes!